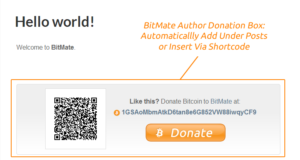 BitMate Author Donations is a simple plugin to help website owners and authors on WordPress powered sites to receive bitcoin donations from their posts. 3. Enter a valid bitcoin address on the User Profile page under “BitMate Donation Information” for any users that wish to enable the donation box. 4. Configure the display options through the “BitMate Settings” page. 5. 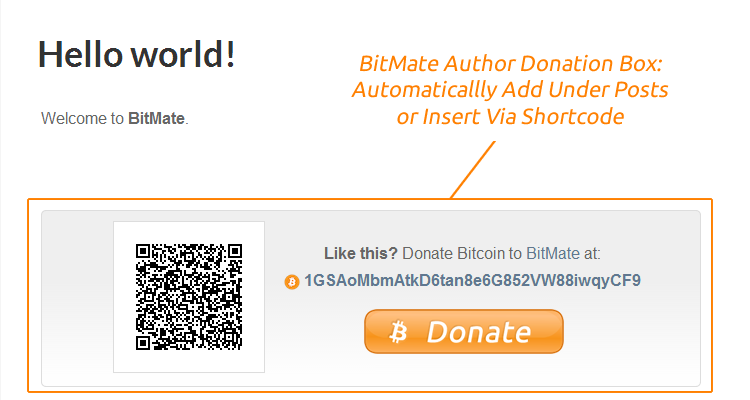 (Optional) Use the [bitmate-author-donate] shortcode anywhere you want to manually include the donation box, e.g. WordPress pages etc. There is a built in settings page where you can enable or disable the automatic inclusion of the donation box underneath all posts. The settings page also allows you to enable/disable a small credit link to this page which we'd love you to include but you don't have to! You can find these settings under “BitMate Settings” in the WordPress dashboard. We'd love to heard your thoughts and suggestions so please feel free to contact us. We read every message and if you require a response we will do our to get to you ASAP! Make sure you also subscribe for the latest updates on all our our plugins and important bitcoin news through the BitMate Insider free newsletter subscription in the sidebar!